Home→Coupons→New Hannaford Rewards Shopping App – Earn Rewards, Clip Coupons & More! 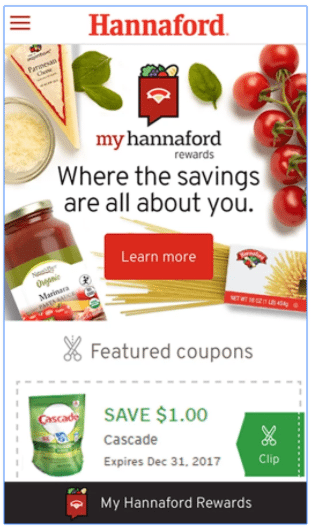 New Hannaford Rewards Shopping App – Earn Rewards, Clip Coupons & More! New Hannaford Rewards Shopping App – Earn Rewards, Clip Coupons, & More! There is a new app in town. Now you can get Hannaford savings at your fingertips! 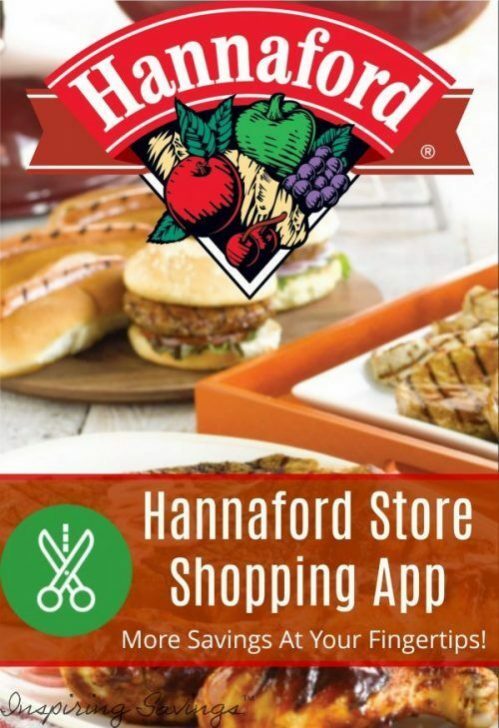 If you are a Hannaford shopper, you are going to want to make sure you download the New Hannaford Rewards Shopping App. With this app you will be able to earn and manage My Hannaford Rewards, clip coupons, and more. Each week you can look through our Hannaford Rewards Coupon Match-ups and deals to find extra savings for your family on top of the added benefit to using this app. The Hannaford Rewards Shopping App lets you earn 2% back on all your Hannaford brand purchases. This will include All Hannaford store brands, including most fresh meat, seafood, produce, deli and bakery items that have one of their store brand names on the package or label. Your rewards can be redeemed quarterly. The Hannaford Rewards Shopping App will send you a notification when it’s time to redeem. Then the next time you shop and scan your barcode, your savings will be deducted from your total. PLUS, when you download the app, you will receive some pretty incredible coupons. Get Ready…….. If you haven’t jumped on board with this app, now is the time to do so. You will notice coupons that state “Just for you”. These coupons are valid for you only. All “Just for you” coupons will vary by users. All other coupons found within the app will be the same for everyone. These coupon offers cannot be “Stacked” or combined with other coupon offers. You will also receive frequently in-app coupons that allow you to save money off your total purchase. See the example image below. Coming soon you will be able to link both Savingstar (SIGN UP HERE) and Ibotta (SIGN UP HERE) grocery savings app to your Hannaford Rewards app. You will be able to connect your new rewards number and continue to earn cash back. Both programs are being currently updated. I would love to hear what other coupons you received and if you have any problems at checkout. Leave a comment below. Hi Heather! It does seem like many are now having problems getting coupons. I have heard that some received them 8 hours after they have downloaded the app. Don’t give up hope yet. The app is very new and I know Hannaford is looking for feedback. One of the concerns, has been already addressed. Such as; a all your clipped coupons disappear once you check out, even if you did not use the coupons (they are wiped from the system). I would keep checking back with your app. Just by word of mouth, I have heard others deleting the app and reinstalling it or signing up using a new email has done the trick. If you end up getting your freebie coupons after troubleshooting, please come back and leave me a comment. I would love to know what worked for you. I have been having trouble trying to log back in. It keeps telling me that my email is wrong or and my password.. so I changed it and still cannot get in.. Try removing the app completely from your phone and downloading it again. This sometimes work. I went to HANNAFORD last night. I cannot seem to find the receipt. Is there a way i can get the savings now without having the receipt or do i have to wait until i shop there again? Hi Heather, You are suppose to show them a bar code from your phone. Once scanned it will deduct all your coupons that have been clipped. The free coupons say a minimum purchase amount is required but doesn’t state what that amount is. Anyone know. I tried calling the store they weren’t sure. They gave me a customer service number but I keep getting they can’t take my call right now. I went and used the free coupons tonight and had major problems. First only a couple coupons came off. So after checking to make sure I had all the correct items the supervisor tried it again with the same result. Not knowing what to do she ended up scanning each item and doing a price reduction for each item. It took well over an hour at the checkout. My free coupons are still showing as clipped and haven’t disappeared. I uninstalled and reinstalled but they are still there. Is there a way on the app to delete a clipped item? How do I receive my free items? I downloaded the app and have clipped items, but I don’t see any free items? Do they email the freebie coupons to you or a link for them or will they appear at some point in your app? Hi Nicole, Once you download the app it should automatically appear under your coupons to clip. Once clipped you are set to shop. Thanks. Nothing has showed up yet but I’ll keep checking. I see that earlier you said some people have had them appear afyrt a while of waiting. Yes! And remember the app is super new. It will take sometime to get all the kinks worked out. Your patience is well worth the effort. This app is actually a pilot for associates only. The free products are for associates. It is not meant for customers, that’s why there are bugs. The customer rollout is next year. HI Greg, Thanks for your comment. I personally, was first introduced to the app by a local store manager who was instructing and encouraging his customers to use this app. He did not mention that this was intended for Hannaford staff only. I would never have known about this app without his speaking up. Please also, keep in mind that once any app becomes “live” on play store or Itunes the public can easily download and use. At this point, the Hannaford app has well over 10,000 downloads on google play and has plenty of great feedback on use. I am sure once Hannaford starts advertising this to their customers they are going to love this app as much as I do. I already earned a couple bucks on my Hannaford Rewards. Downloaded app and free items were listed right away. Biggest problem was lack of internet connection in store. Local store does not have WiFi network and cell phone reception inside store is basically nonexistent. When I would lose connection I could not see what coupon I had clipped. If app is going to require internet connection to work properly or conviently Hannaford my have to consider installing a WiFi network for customers to use. Since I had clipped my coupons before going in store once I checked out they were all credited. That is a great suggestion Ed! When Target first started with their Cartwheel app I was having the same issue shopping their store as well. They soon added the free wifi for shoppers. It is a win/win. You add in Wifi we stay and shop longer. Hi Karen, Have you done any troubleshooting on the app yet? Such as deleting it, downloading it again and signing in? It has worked for many. If still not working I would reach out to Hannaford. I went last night…went up and down every aisle looking for my free items (that was the work)…I got free eggs, bread, Nutella spread, brownie for 1, glade air freshener, tissues, perdue chicken nuggets, pup peroni, chobani yogurt, and a few other items…put a few extras in my carts…checked out and all the coupons worked but I heard from others that it didn’t work for them. Thank you Vanessa for commenting. They definitely gave us a nice scavenger hunt. Enjoy those savings. I believe everyone who is now downloading the app are only receiving the $5.50 coupons. It was fun while it lasted. I used the app and got my free stuff. I too was recently told that it was “jyst for associates only” and they are no longer honoring it for the public. If they wanted it to be used for employees only, they should have made sure only employees were able to download with a badge or other number to confirm employment. ABSOLUTELY! You can beta test an app without it ever going public to download. I am so glad you go your freebies. Enjoy! There was an issue with the release. They wanted to associates to pilot the app before it was released to the public, so all the bugs could be ironed out, but that didn’t happen. The Hannaford stores around here still honored the app and the savings even if you were not an employee. Thanks Stephanie. I appreciate your comment. As with the app, the manager of one of my local Hannaford stores informed me about it. At time of check out he was instructing me on how to use it. In fact, he was encouraging everyone to use it. Maybe not all employees were informed of the early release, but once it is released on google play or itunes you can not prevent others to download it. It is public. Hannaford could have released it very easily to all employees without making it public. Many app developers provide private beta testing downloads. No freebie coupons when I just joined. I have a Windows phone which is not compatible with iphone or Google Play apps. Will you be offering this app soon? I got an email telling me I have “Just for you” coupons but in the app they are not there? Some help would be appreciated! Hi Wendy! I got the same email this morning. I do not work for Hannaford. I am not seeing the coupon either. Did you get a request for $9 off of $45? I would contact Hannaford directly. That is what I did. I have not heard anything back yet. Thanks for the comment. I have been shopping at Hannaford for at least 20 years. One of the things that I liked was that you did not need a card to get the sale prices. I must admit that I shopped at price chopper when I saw sales in their fliers. I tried to download your app and I became frustrated with all the information you seem to need. I am not a computer geek, but at 78 years old cam not computer illiterate. I shop on the computer and do all my banking on the computer, you new app sway to complicated! JUST GIVE PEOPLE A CARD LIKE ALL THE OTHER STORES AND I WILL SHOP THERE AGAIN, FOR NOW I GUESS I WILL GO BACK TO PRICE CHOPPER. My clipped coupons will not show up. It keeps telling me they are preparing my coupons and to please stand by, however, they never load. Love the app. so since i started using it, it seems the Ibotta Hannaford number does not work. The app number is 1 digit more so you cant link the 2 accounts. I give the cashier my hannaford number to scan for Ibotta then my phone number for the App. Can the 2 be used together? The Ibotta doesn’t seem to like it. I have not received credit from them in the last 2 weeks. I wonder if one is over riding the other. I have contacted Ibotta and they are also looking to it. Any suggestions. I would love that too as well Dawn. As well as Linking Clynk to the app. You best guess would be to contact Hannaford directly and ask. The app doesn’t formally get announced until January as they are still working out all the bugs. This would be a wonderful addition. I don’t work for Hannaford, but share a love for saving money. This led me to write about this app. I’m so excited to find out about this app! All of the freebies and coupons downloaded right away and are in my clipped coupons section. Just one question – how do I redeem these awesome coupons?! Do I just show them the barcode under “My Hannaford Rewards”?! Sorry to be THIS person!! Yep.. Ashley that is it! At checkout just show them the bar code on your app. Once scanned all the coupon come right off. It is magical. LOL Have a great time shopping. I signed up for the Rewards program in Sept., via computer since I don’t have a smart phone, and am trying to cash rewards and cashier was not very helpful, nor is your website. How, exactly, is this done? HI Karl, I do not work for Hannaford. You see I am a savings deal blog. But I would love to help. At the end of each quarter you will receive an email stating that you can now use your rewards. There is a pop up or button that will state “Activated your rewards” at that time the money you accrued will them be added to your account and you can have them scan your barcode or use your phone number at checkout to receive your discount. Just an FYI, that email went out the very beginning of January. But you do not need the email to activate your rewards. You should be able to do it right online or from mobile. I already have a myHannaford number. How do I sign up for the Rewards Program? You can either download the app to your smart phone or visit Hannaford’s website to sign up. I am assuming that this app only works with IPhones? This bites! I sign up with enthusiasm just to find out I can’t use it? Unless I am totally missing something. This app works on android too. I also have an android based phone and the app works fine. What problem are you running into? I installed the app on my Android device yesterday. I clipped coupons and the number of coupons clipped shows on the “My Clipped Coupons” bar, but when I click it, it shows “You haven’t clipped any coupons yet. Get Clipping!” and displays a red “Get Coupons” bar. I have found this happens often. I would actually reach out to Hannaford.com. HOWEVER, with this said. Even though it says you have no clipped coupons, if you click on “my clipped coupons” they will actually show up. I have seen this way to often in my own experience with this app. Hello. They have just launched this rewards program at our local Hannaford. I was unable to download the app on my phone, and still can’t right now as it is an older iPhone and the app requires iOS 8 or higher. I have shopped at the store twice since they started the rewards program and was told that I could enter the ‘Pin’ number at the bottom of my receipts somewhere on the website once I signed up for a rewards account, but I could not find where to do that at all. Can anyone here assist? Thank you! Please note that I am not a Hannaford employee nor do I work for Hannaford, but I can help. You see I am a savings deal blogger and love to share any information that I can about saving money with others. I post this information about the Rewards program to help. 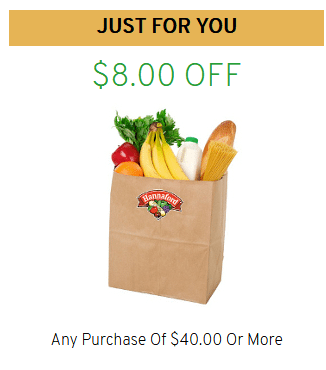 Nonetheless, You will need to sign up here (copy & paste in your browser from desk top) http://www.hannaford.com/user/hannaford_rewards.jsp Once you register then you will be given a Hannaford Rewards Number. I was told that they can look you up by phone number at check out. You can also print your rewards number and give that to them at checkout. When you do eventually upgrade your phone and are able to download the app, all you will need to do after download is sign into your account. Thank you for the reply. I did already sign up so I do have an account. My issue is being able to submit receipts to receive credit for those purchases I made before I signed up for the account. I searched the website, but I couldn’t find anywhere to do that, but one of the Hannaford employees at our local store said it was possible. You won’t be able to get credit on past purchases. It will be from the time of sign up and moving forward. Just don’t forget to give them your info at checkout. As of right now there is no way of capturing your receipt to earn credit back. I am unable to download the app. I get a message saying that my phone is incompatible with the version. I can download every other app I want to so I know it’s not my phone. I have set up an account. I have tried several times to download the app. Tried in the store and at home. I downloaded the Hannaford app and used the code at the checkout today. I do not see that the rewards went to my account and the coupons didn’t work. Can you use your free items coupons all at once. I downloaded and set up the hannaford app and got 4 coupons for free items Bodyarmor sports drink, chloe’s Frozen Fruit Bars,Goldfish Crackers and Lala yogurt smoothie. I am going shopping tonight and would love to pick them up all at once. I’m confused how you even scan anything. I put the app on my iPhone but how do u scan a barcode ? And I just to found out about it today at checkout. Can I use today’s receipt towards my rewards. The whole thing just seems it needs alittle more how to information. Your rewards will start after you register. You can’t work backwards unfortunately. This is a new rewards program from Hannaford. 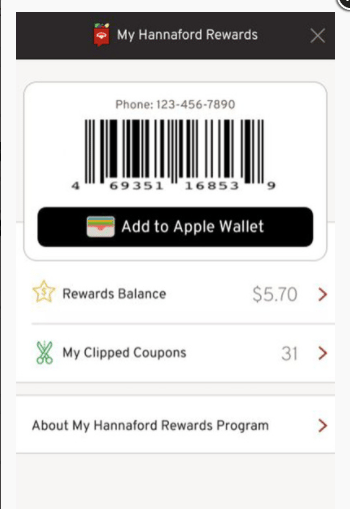 To find your barcode go into the app on your phone, next find “my hannaford rewards” you will then see a barcode that you will have the cashier scan at time of checkout. I am sorry this seems confusing to you. Once you get the hang of it, believe me it will be a piece of cake. I have been using it myself since August. How many coupons can be used at one time? Great Question! Only one coupon per item can be used. You can clip as many as you like on your app and purchase 1 of each items, unless the coupon indicates you must purchase a set amount. Such as $1.00/2. Then you must purchase two items to receive your discount. All coupons clips will be deducted at check out once you provide the cashier with your smartphone barcode or phone number that links to your account. I went to the Hannaford Store yesterday and purchased $150 worth of groceries. I forget to show my iPhone to the cashier. And the cashier did not remind me. Therefore I was not credited the Hannaford items. I purchase lots of Hannaford brand items. How can I get the credit for those items? The store said they could not help me. OUCH!!! Oh Deborah I am very sorry. I know you are not the only one this has happened too. I would head back over to your local Hannaford store and visit customer service. I am sure they would be able to help you out and get your points added to your account. Is the free food just for new sign up membership? If not when do they update new ones. I would like to do my shopping day to match new uploads of the free food and the coupons I’ll be using for that day. Yes, you are correct. The free grocery offers are for new app users. They do often update coupons. They typically send out emails informing you of the new coupons. I received an email last week. Does the email include a free item each week like Shaw’s does? It does not. It just contains a few “Just for you coupons”. You will notice the difference between the manufacture coupon and the Hannaford coupons. Each are a different color on the app. Can this coupon service be used without phone present? My husband does the shopping and does not have a smart phone. I would retain the account and emails. Can this be accomplished? Absolutely, At checkout all you need to do is provide your cashier with the phone number you register with. You can visit Hannaford.com to sign up for your account. Hi I registered but did not receive a barcode. Where do you get a barcode? That is wonderful. When you sign up online you do not receive a bar code. At checkout just provide the cashier with the phone number you used to sign up with. You account will be credited with 2% rewards if applicable. If you end up downloading their app to your smartphone, you will at this point just log in. My partner and I often alternate shopping duties. I am the one who signed up for the rewards program. Is there a way to link his phone number to my account so that he doesn’t need to remember my phone number? HI Rich!!! Absolutely. Once he downloads the app to his device, go ahead and have him log in using the account information that you originally signed up for. At this moment, in time I do not think there is a way to link two phone numbers to one account. But you can share account info through the app download. I hope this helps and is a quick solution for you. is there anything you cant spend your rewards on like beer? Thank you Frank. That does make a lot of sense. It would be great if that added that to the fine print on their website. Milk is actually regulated by the state, just like alcohol and cigarettes. i am an employee at hannaford a and i been trying to get rewards from the begin in august 2017 i had every body tell me my number works but it does not i starting to give up but when i do shop i spend money for the purpose im there easy to pick up is there a way i can get my rewards due to the fact i dont have a smart phone all i have is a government issue phone that was issue to me as i once was homeless and is try to save money to survive so it would be nice to get resolved thank you and have nice day. I am very sorry to hear you are having problems. Just for safety concerns I removed your phone number from the comments. I don’t work for Hannaford and only report saving opportunities for my readers. It sound like you are having issues with your account. I would reach out to Hannaford corporate using this link below. (copy & paste into your browser). They are the best ones to reach out to in terms of not being able to use your rewards. Hi Rebecca, Sounds like you have some complaints that you need to direct at Hannaford. I am a frugal living deal blogger and do like to share my knowledge of promotions and deals to pass on some savings. I would reach out to Hannaford directly through their site and let them know the problems you have run in to. I am sure they would hate to lose your business and would like to get you with their rewards program. Just an FYI, at checkout you have the option to type in your phone number onto the credit card pad. You receipt with purchases will then be linked to your rewards card or you can scan the bar coded provided on the rewards app. 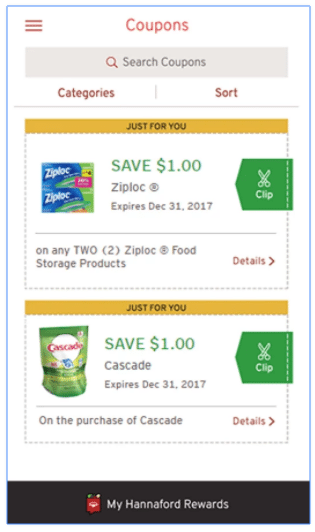 Are my digitally clipped coupons linked to my phone number that I input or do I have to carry my phone to the store with me and let them scan the link on my phone? I have the Hannaford app on my phone and forgot my password. I clicked, forgot my password, but then it says the email address I have is not on file. It’s the only email address I have on my phone. It won’t even let me create a new account because the phone number is being used. Like no kidding,it’s my number. What do I do? I miss getting my coupons. I am sorry you are having problems with your app. Sounds like you need to reach out to Hannaford stores directly. You can copy and paste this link into your browser and go from there. I did that and they never replied back. OH GEEZS!!!! That is no good. Have you tried logging in online? I guess another option would be creating another account, but you will end up losing out on money earned. I’m on my home PC now and yes tried to create another account. I only have one cell phone and the number’s the same so when I tried to create a new account, it says that number is already being used by another account. Just very frustrating. I am so sorry Rockee. I wish there was more I can do. I don’t work for Hannaford. I thought I saw a 1-800 number on their website. Maybe try that? I feel your frustration. HI,I wonder how long after clipping a coupon,I can shop for the clipped item.I clipped a coupon Tuesday or Wednesday and it would not show at checkout on Thursday afternoon.Same a week ago.It has worked before and I really love saving money,well who doesn’t. The reward program is very appreciated. It should be immediate. You can view your clipped coupons under your Hannaford rewards. If the coupon did not come off, mention it at the time of checkout to your cashier or bring it to the attention of customer service. I have noticed though, that the fine print is a must. Make sure you double check and read that fine print. A lot of times there are exclusions. Thanks for your answer.I did ask the lady at the register,but there was nothing she could do.I did check the clipped coupon at home, I had the right brand,size and quantity .Also I clip on my PC and use my phone# at checkout. If the cashier cannot help always head on over to customer service. I just went to Hannaford tonight. My clipped coupon did not come off and customer service was able to hand me cash back for my purchase. They confirm the correct size and product purchased. Sometimes things just happen. All in all, once you clip your coupons you should have no problems using immediately. Thanks again.I will try this if it happens again.Just hope there is not a problem to prove that I clipped the coupon, since I clip on my PC . How do I sign up to earn 2% rewards on store brand items? I am a Hannaford employee, but am not responding as an agent of the company with regard to my comments. Stores that have WI-FI may still have issues with it that are outside of their ability to resolve, for example those that are issues of their local internet service provider. For that reason, customers reviewing and clipping their Rewards coupons where they have usually have a very reliable internet connection (at home?) before they come to shop may improve their success at having clipped coupons be applied. Your store may have a kiosk with an internet connection near the Customer Service desk, and a call to the store requesting employee assistance at a specified time to help with your Rewards Program issues (or to sign up) may solve some types of problems. (This might be more difficult for a store to accommodate at the store’s extremely busy times or when there is an employee trained to provide this assistance available, which is why I suggest you call first.) It’s my understanding that these kiosks were put into stores to facilitate assisted sign up for the Rewards Program. When we can provide this help, we can often also monitor your purchase process immediately afterward to provide some ‘first use’ assistance that might be helpful. Resolution of issues with 3rd party apps (like Ibotta or Savingstar) cannot generally be resolve in this way; and, even though these apps will provide some benefits according to their software provisions afforded their users, there is currently no way to connect to these programs by simply inputting the phone number you linked to your My Hannaford Rewards account when you signed up for our program. A link to your Ibotta or Savingstar account currently requires the scanning of your myHannaford bar code (on a tag, paper, or smart phone app), or the entry of the number found below that bar code by the cashier. If you have had a myHannaford account for years (to make online shopping list or use our ToGo shopping service available at some stores, it is worth mentioning that old numbers for myHanaford accounts may not work due to an incompatibility with the number of digits required by Ibotta or Savinstar. The solution, should this occur, is to simply get a new myHannaford number. The new numbers are the right length. Once again, I am not providing this as an agent or spokesperson of Hannaford. I am not authorized to speak in that capacity. If, however, any of the comments I’ve made help anyone solve some issues that have prevented them from getting the benefits of the My Hannaford Rewards program Hannaford offers its customers, I would be pleased. I believe it is a good program. Thank you so much, Margaret, for your additional comments. I do believe this will help with many who have had issues. I appreciate your response. Please note, any Ibotta benefits that are not also part of the Hannaford Rewards program will not come off your Hannaford transaction total. They will be credited to your Ibotta account just as they were prior to linking with Hannaford Rewards. You will find similar linking information between Hannaford Rewards and Savingstar here: http://www.hannaford.com/copageName=SaveShopLanding&leftNavArea=ShopLeftNavntent.jsp? I loved this app…however it is no longer working on my I-phone. I called Hannaford’s headquarters and they said they had been having trouble; that was 2 weeks ago and I still can’t access the app! I can go on my desktop for coupons but when I get to the store, if I haven’t made a list, I am unable to see coupons on phone. I tried deleting and reinstalling…but it just brings my old app down from the clouds! Help! Sounds Like you did everything you are supposed too. I would read through the comments on this post. A few Hannaford employees have jumped in with some troubleshooting ideas. Clipped coupons in the app. Went to the store and purchased the correct items and coupons are not coming off. Did this twice already!!! If ever this happens, head over to customer service they will correct it.